I get quite a few requests every month to fill bands that have been inserted elsewhere. Usually a provider will offer a one or two year package which will include unlimited fills and defills. Once this period is over, the banded individual (bandit) will try to find a provider closer to home or perhaps someone more convenient in terms of cost or availability. This is all good if everything from operation to fills to weight loss is going swimmingly well. The flexibility provided demonstrates one of the great benefits of having a band which means that one can vary the restriction at any point in time by a simple injection performed in clinic. Many bandits request a band deflation and a period of rest if reflux is becoming problematic or they would like to enjoy a big event or holiday before re-filling. However, I always warn that re-fills to the same level may not achieve the same amount of restriction or perhaps even cause too much restriction. 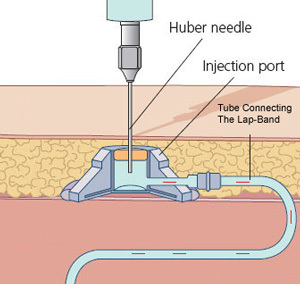 It is also important to remember that over a period of time 1 in 10 bands may move out of place (slippage or erosion), the tubing may leak or the port may change position which may lead to a kink of the tubing. These variations sometimes only become apparent when the band is being filled or defilled. That is why it is important to find a provider who understands the spectrum of variations that can occur, how to deal with them and can offer an aftercare package that includes unlimited fills and de-fills for peace of mind. Band flexibility is a great option but you must maintain it with a knowledgeable provider.